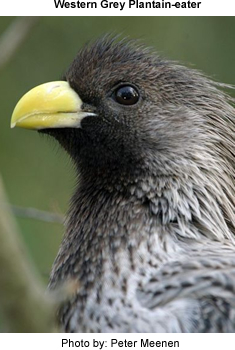 The Western Grey Plantain-eater or Grey Plantain-eater, Crinifer piscator, is a large member of the turaco family, a group of large arboreal near-passerine birds restricted to Africa. Throughout its range the Western Grey Plantain-eater frequents open habitats, woodland, parks and savannah from sea level to around 1300 m.
The Western Grey is monotypic (a genus consisting of only one species), but is considered to form a super-species with the Eastern Grey Plaintain-eater (C.zonurus). This species is a resident breeder in open woodland habitats in tropical west Africa. Hens lays two or three eggs in a tree platform nest. In aviculture, the Western Grey Plaintain-eater is probably more common than the Eastern Gray - although pairs are not currently producing many offspring. A typical Western Grey Plaintain-eater weighs 200 - 300g and measures approximately 50 cm from beak to tail. These turacos are common, noisy and conspicuous birds, despite lacking the brilliant colors of relatives such as the Violet Turaco. Their plumage is mainly grey above spotted with brown. The head, erectile crest, neck and breast are brown streaked with silver. The underparts are whitish, heavily streaked with brown. Western Grey Plantain-eater has a thick bright yellow bill, and shows a white wing bar in flight. The sexes are identical, but immatures have a black woolly head without silver streaking. This species generally feeds on fruits, especially figs, but will also eat leaves, seeds and other vegetable matter. Grey Plantain-eater has a loud cow-cow-cow call, very familiar in west Africa.